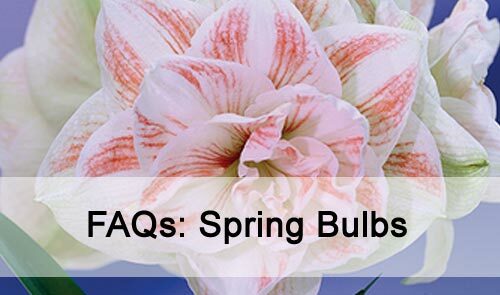 FAQs: Spring Bulbs This article lists frequently asked questions about spring flowering bulbs. In most part of New Zealand, chilling is not necessary. In areas with mild winters it is a very good idea to chill your bulbs before planting so they have enough cold time to complete the flower bud development and stem elongation inside the bulb. A lack of chilling can be caused by being in a warm area, but also by planting in pots and leaving them in a sunny, warm position after planting. Please [click here] to read our detailed Fact Sheet on this subject. What's the fuss about English or Spanish bluebells? Spanish bluebells (Hyacinthoides hispanica) grow more vigorously than English bluebells (hyacinthoides non-scripta). They are taller with stronger stems and have little or no fragrance. They hybridise readily with the English bluebells and in many woodland areas of England they are taking over from the native bluebell to the extent that the native species is becoming endangered. The true English bluebell has a stem that droops to one side and it is fragrant. So are our bluebells the real thing? We're not confident that they are, we think they are a hybrid between the English and Spanish. I'm after some Fresia Burtonii, the old fashioned cream one. Do you have any? The old creamy freesia with the yellow throat is called Freesia Burtonii. It's a NZ strain discovered in the garden of a Mrs Burton (surprise!) many decades ago and is a mutant from the species Freesia Refracta alba. F. Burtonii does not grow from seed and has to be increased from bulb offsets. In the right place it increases really well and makes a great show in early spring. It's not grown commercially and the best way to find some is to take a walk through an older part of town at flowering time and knock on a door if you see a good patch. We have a small patch here which performed better last year than I have ever seen, but we don't have anywhere near enough to start selling it. For our spring bulb catalogue that is released in early February, shipping starts on 1 April. Many bulbs are not even in stock until we're a week into March, and it takes a lot of time to get everything packed up and ready for shipping to start. Do you have Fritillaria bulbs? These have been in very short supply in recent years and it varies from year to year whether we have any. Because the supply has been so limited we only offer them through our web site so we can cut sales off when they are all gone. If we have them, you'll find them in the Web Only section. Do you have Allium bulbs? No we do not. For some time now it has not been possible to import alliums into New Zealand due to plant health regulations. Ornamental alliums can carry diseases that could be very damaging to commercial onion crops, and that is why they are restricted. Did you know that New Zealand produces an eye-watering (sorry!) 200,000 tonnes of onions a year? 90% of the crop is exported, so it is important to keep diseases out. Can we do fund raising with your bulbs? Yes you can, please contact us and we will send you details of how it all works. Can I grow peonies in my area? As long as you get about three white frosts a year on the ground then it should be cold enough for you to grow peonies successfully. Quite a number of our clients in warmer areas provide artificial chilling for their peonies with great success. Freeze a few litres of water inside a plastic bag or container. When frozen, place it on top of the plant base in winter time at night. It'll take a good few hours to thaw, and the plastic container keeps the water from dripping down and drowning it. All our freesias are fragrant to some degree, it varies from variety to variety. All modern freesias are rated not only on growth and flower quality, but also on fragrance, so it is a very important part of the commercial cut flower varieties that we offer for sale. Should I lift my bulbs and how should I store them? Unless you're lifting spring flowering bulbs annually to give them a chilling treatment every autumn before re-planting then you can leave most bulbs in the ground for quite a few years. They'll need lifting and dividing if they are becoming too crowded - a sure sign of this is lots of leaves and few flowers, caused by too much competition for limited soil nutrient and light. It's a good idea to remove bulbs from pots and re-plant in fresh mix each season. Any slow-release fertiliser in the mix when you planted will be well and truly gone after a year, and the mix will also be deteriorating and losing its structure. Fresh mix including some long-lasting slow-release fertiliser will ensure great results every year. Do you have Lachenalia bulbs? Not at the moment. Stocks have been very limited in recent years, but we are slowly increrasing them and hope to sell some in 2020. Are Naked Ladies and Amaryllis belladonna the same thing? Yes they are. Amaryllis belladonna produce their flower stems in early autumn (usually mid March), before any leaves have grown. The leaves come up after flowering, hence the name 'Naked ladies'. What is the Saffron crocus and when should I plant it? Saffron comes from the harvested and dried stamens of Crocus sativus, the saffron crocus. We sell the corms of this species in February and March and it should be planted by the end of March. It will flower in mid autumn and you can harvest the stamens from the open flowers and dry them carefully to have your very own saffron for cooking. It loves a good hot summer baking, so plant it in a full sun area. Will a peony tuber flower the year I plant it? Yes it will. If planted in winter when we sell them, and if it received enough winter cold from some frosts then it will produce some flowers in the first growing season. It will flower much more strongly in the second and subsequent seasons after the tuber has settled in and grown larger. I left my bulbs in the fridge, can I still plant them? If it is not yet mid winter then yes, the best thing is to plant them. They won't keep until next year, so you have nothing to lose! How do I know when my garlic is ready to harvest? While the traditional rule is to plant on the shortest day and harvest on the longest day, rules are just there to be broken! We can't be slaves to these things and garlic can be planted any time from early June to early August. Harvest when it is ready - when the leaves start to yellow and die back in early summer. Do you sell hyacinth glasses? We do offer them under the Accessories section of our web site. Check out our Fact Sheet on growing hyacinths in glasses here.